What a week it was at Bell MTS Place. 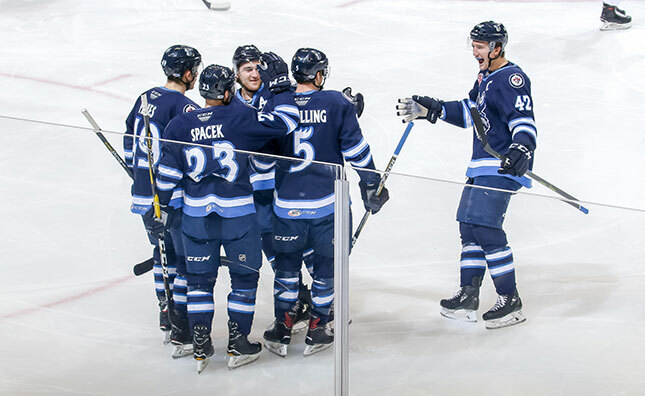 The Manitoba Moose and Winnipeg Jets took turns working downtown over the past seven days and combined to go the whole week without losing in regulation. The Moose wrapped up the week to remember with a 4-2 win over the Milwaukee Admirals Wednesday night, leaving the two Winnipeg-based pro teams with six victories and a shootout loss over the seven games. Rookie Logan Stanley scored in Wednesday’s win for the American Hockey League team, and says his outfit knows the value of picking up points now in its push for a playoff spot. With Wednesday’s win the Moose hold a 6-2-0-1 mark in nine games since the holiday break, including an impressive 5-0-0-1 log in their last six at home. Those numbers represent the best run of the season for Manitoba and have lifted the team to within a game of .500 at mid-season with a 17-18-2-1 record. It’s a nice turnaround for a club whose lineup has been dramatically impacted by injuries and call-ups for large portions of the season so far. Despite some roster stability driving recent success, injuries are still impacting forward depth. To that end, Manitoba signed centre Chris Collins from the ECHL’s Kalamazoo Wings where he was leading the league in scoring. The 26 year-old spent the previous five seasons with the University of Calgary where the schedule allowed him to continue to hone his craft. Collins had 23 points on a 10-game point streak at the time of his signing. The Moose practice downtown at Bell MTS Place Friday morning before hosting the San Antonio Rampage there Saturday and Sunday at 2 p.m. Saturday’s game is Grassroots Hockey Day, featuring a Mason Appleton mini-bobblehead giveaway for the first 3,000 fans at the arena. Sunday’s matchup is Star Wars Day as the moose close out their six-game home stand. Tickets for both games are available at moosehockey.com/tickets.